and your PURSUIT TOWARDS SUCCESS? Relationships, Financial and Career Life? that is in this world and beyond. our Beloved Prophet s.a.w. to us. Every Mondays (excluding 5th of the Month). For registration status check your inbox or sms/call 9476 2653 or email: registrations@aspireinstitute.com. the Quran’s original framework is maintained. bilingually in Malay and English, 4 times a month. the program aims to complete 30 Juz of the Quran in 5 years. He gets true happiness from the Quran. it provides him with the answer he’s looking for. as it should be for the rest of us, he feels. with us the powerful messages God has left for us in His Quran. Read, Understand and Apply Al-Quran in LIFE. from State Islamic University (UIN) Syarif Hidayatullah in Jakarta. 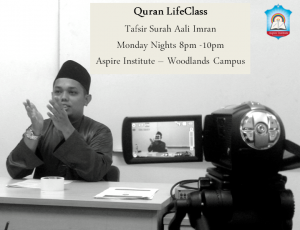 His studies focused on the Quran, Phenomenology &amp; Socio-Linguistics. taufiq success into our lives!